Is There a Benefit to Having Smaller Numbers in Your Fraternity? Question: Is there a benefit to having smaller numbers in your fraternity? What is your opinion on having two recruitment classes in a semester? Do you have any advice? Should Our Fraternity Give This Guy a Bid? I’m our fraternity vice president, but do a lot of the president’s work as he’s working a lot (it’s like having 2 presidents ). We gave a bid to a guy some brothers don’t feel fit “our normal image” and next week they will try to cut him early. Some brothers feel he is “sloppy seconds” as he rushed a different fraternity 2 years ago and quit. Other brothers feel that he may not keep quiet about certain secrets. Our fraternity had a great rush and now we have a large pledge class. What is the best way to start a pledge program to get these guys quickly involved? We are worried that some guys may quit, and that is the last thing we want. Thank you. I have received this question about 100 times this past week in several different forms. The answer is very simple, but the politically correct world doesn’t like the answer. However, I will give it to you straight. The fraternity president must do these 10 things during fraternity recruitment to ensure that the fraternity is successful during rush. Fraternity Recruitment is one of the most important and difficult tasks a fraternity has to accomplish to survive. This article will help turn fraternity recruitment a chapter strength. 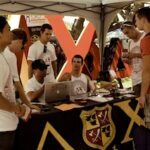 5 Ways Your Fraternity Can KILL IT during Recruitment details 5 essential things your fraternity must remember to recruit quality guys fast. I am the rush chair of a small struggling chapter looking for a bit of advice on rush events. When it comes to rush week our rush events have always been lackluster to say to least. How does my fraternity have a good rush week? Should Our Fraternity Recruit an Old Guy? My current fraternity president met a 32 year old dude at the gym and wants him to join the fraternity. He’s a cool person but do you think the age would be a problem? How does a Fraternity Recruit Without a House or Parties? I go to a school with a rapidly growing Greek scene. However, we do not have Greek Housing currently. We have a large female population so rush is really centered on bringing guys out to parties at unofficial houses. We will not have a house next year as the school is cracking down on the party scene. How do you get guys to join your fraternity? Our house doesn’t have the reputation others may have, but we are on the rise on our campus. Many of the rushees we gave bid cards to are sitting on the fence between us and another house with a better reputation. What can be done to get over this hump? My fraternity may be going on social probation. I am afraid of not being competitive come rush. Can you help? So, a huge question is how do you get guys to attend your fraternity’s rush event?